At Vox.com, journalist David Roberts recently published a piece entitled “Is 100% renewable energy realistic? Here’s what we know” relying on two assessments of 100% renewable scenarios. Both of which were written by (non-German) proponents of nuclear. As I showed in a previous post, that wasn’t all we know – English speakers are ignoring the biggest studies from Denmark and Germany. 5. If you don't like this conclusion, the way to refute it is not w/ generic anti-nuke rants about current costs, current tech, etc. Another thing is also overlooked: France. 100% is hard to do, as the French learned with nuclear. In 1974, they adopted their Messmer Plan for an all-electric, all-nuclear energy supply. It was a technocratic decision without any democratic input. It failed. Though nuclear advocates point to France as a shining example, the country currently gets only two fifths of its energy from nuclear, far below the 100% envisioned by 2000. One wonders what kind of electric mobility the French wanted back then. There seem to have been no grand schemes for Renault and Peugeot to make only electric cars – or for the French to forego cars altogether. Whatever the case, electric mobility seems more likely today; and yet, France is not revisiting its old plans (nuclear proponents should help us understand why). On the contrary, it has capped total nuclear capacity at 63 GW and will close its oldest reactors if / when then next one – an EPR – goes online. The French wanted to get heat from nuclear power, but that didn’t work either. Demand for space heat from electricity already doubles demand for electricity. It peaked above 100 GW in 2012, more than 50% above the maximum output of the entire nuclear fleet. France could have installed lots more nuclear to meet that demand; the Messmer Plan would have had three times more reactors by 2000. But the French essentially stopped adding reactors where the maximum output reached minimum power demand. The goal seems to have been avoiding the need to ramp reactor output up and down (that, at least, worked). If France had to meet that peak demand for heat with nuclear, French reactors would need to cut capacity utilization in half for most of the year, thereby roughly doubling the cost. Electric heaters in France are found in a fifth of homes but double demand for power. Magenta area: power for heat. Blue area: all other electricity. Source: RTE. France may hesitate to go 100% nuclear because, in fact, only 20% of French homes have electric heat, so even tripling the nuclear fleet wouldn’t get us all the way. We need to renovate our buildings to the Passive House standard so that far less heat (and air-conditioning) is needed. When I am asked whether I think we will be 100% renewable in 2050, I always say no – we could, but we won’t because whenever I look out the window, I see unrenovated buildings everywhere. We are 33 years away from 2050, so any building renovated or constructed soon, but not to be completely carbon-free, will hold us back from being zero-carbon. The real challenge to approaching 100% is thus not technical (not storage, grid stability, and other issues that engineers focus on), but societal: getting people today to renovate/build for a carbon-free 2050 even when there is no mid-term, much less short-term, financial payback (given low oil prices). But let’s return to the dispatchability of nuclear. If France tripled its nuclear fleet, these reactors would have to ramp down every day. I described the actual flexibility of the French and German nuclear fleets here. Suffice it to say the reactors do react, just not the way needed for a 100% nuclear/wind/solar mix, which therefore cannot work. Nuclear proponents say that reactors could ramp more (or be retrofitted to do so) but don’t because they provide the cheapest electricity based on low fuel prices; once you have built a reactor, you might as well leave it running all the time. This is true. Building a reactor is prohibitively expensive; the fuel rods, not so much. The problem is that, if we are going to go 100% renewable largely with wind and solar, we need backup that ramps amazingly well. 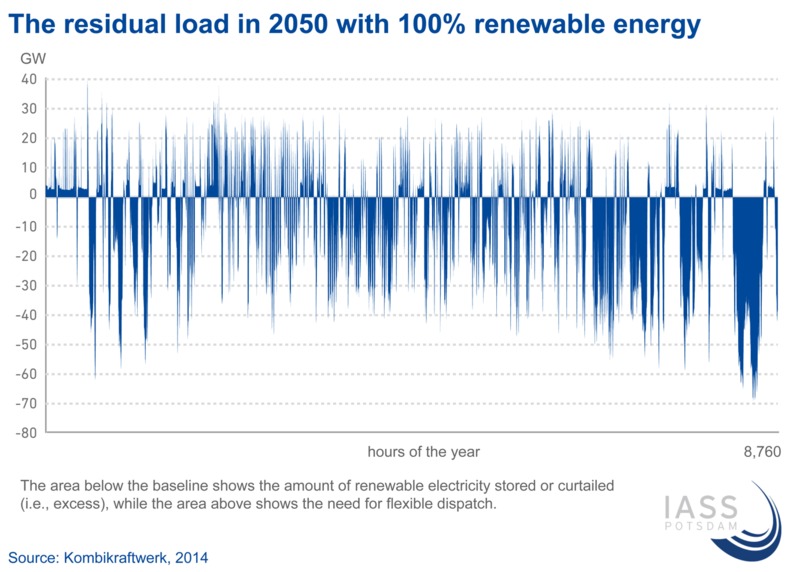 Here is what Germany’s residual load – power demand minus renewable power generation (largely wind and solar) – might look like in 2050 with 100% renewables. The ramping French nuclear reactor shown here may look like it would be able to follow the residual load needed in 2050 for wind and solar, but in fact that reactor only ramps from 90% to 30% of its rated output. Current made-to-ramp reactors are designed to only have 400 cold starts (down to 0% and back up) in their entire lifetime – around once a month over forty years (including refueling downtime). They might not last two years in the chart above. It’s quite possible that nuclear with wind & solar is cheaper in the mid-term, but eventually wind and solar peaks will hit the must-run capacity of nuclear, and then storage is needed. Storage will make everything much more expensive. So German researchers have argued for years that all inflexibility has to be removed if wind and solar are at the center of power supply. Both the Danish and German scenarios for 100% renewable energy/power, respectively, discussed here include biomass, locally sourced from waste to the extent possible. They call into question what Roberts calls (and the French called) “electrify everything” – the assumption that a 100% renewable energy supply will entail 100% electric mobility and heat. There simply is a certain amount of sustainable biomass available (such as from waste) for use as fuel, so not everything needs to be electrified. Strangely, Americans in particular seem afraid to talk about biomass, perhaps because some nuclear proponents there like to misrepresent all biomass as pristine American forests. Not surprisingly, the main scenario for a 100% renewable America has no biomass at all in it. Acting as though no sustainable biomass exists is purely ideological, not based on any science. My first conclusion is that our current nuclear fleet is incompatible with fluctuating wind and spikey solar. You can focus on nuclear if you want, but the more of it you have, the less space there is for wind and solar. Second, mere dispatchability is irrelevant. If you want near 100% zero-carbon energy with wind and solar, you want backup that can shut down and ramp up from a cold start every day. Nuclear is worse at this than coal, gas, biomass, and hydro. Any future reactor designs will need to ramp like gas turbines to back up wind and solar. In conclusion, we don’t need to answer Roberts’ question about whether there is a better “dispatchable” source of zero-carbon power than nuclear. Rather, we need to dispel the notion that “dispatchable” alone will suffice. You can try deep decarbonization based mostly on nuclear and look to the French model (which France is abandoning) to improve upon. Or you can follow Denmark and Germany with renewables – largely wind and solar, but you can’t leave out biomass. Personally, I’d love to see an experiment based mainly on nuclear. In return, if you want nuclear, you will love to see the Energiewende play out. Let’s meet in 2050 and compare who performed better! I bet anyone a beer, it’s renewables – any takers? I am an undergraduate in Taiwan and have been intensively following your articles in this blog, since I am about to study renewable in Germany (in Freiburg, if things go well) this autumn, and also because I believe the islanders should pay more attention to what is happening right now in Europe and the US, if we are to reach 20% renewable share in electricity, as the government plans. Speaking of the cost of storage, me and my friend (a to-be graduate in power electronics also after this summer) had a discussion on the advantage of a DC grid last weekend, at least in a micro scale. One of the advantages we covered of was that cost of storage in batteries might be less in such a grid. I wonder if any study has been conducted on related subjects. I would be very thankful if you have any. 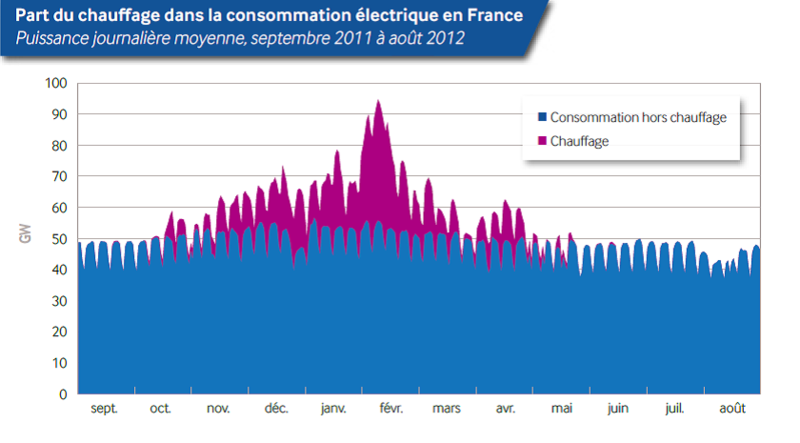 The thermal output of nuclear reactors in France is up around 200 GW Craig. The thermal rating of France’s nuclear fleet is up around 200 GW. If you wanted to deliver 100 GW of heat from the existing nuclear fleet you could do at least part of this with co-generation. Another option would be to use 35 GW of heat pumps to deliver 100 GW of heat. You don’t ramp down to zero with a nuclear plant… You ramp down to a low power level like 15% and then dump steam to the atmosphere to get rid of the remaining energy. This allows you to keep your equipment warm and in hot standby. A better option to make nuclear flexible is to pair it with pumped hydro and conventional hydro that has flexibility. Then there’s time shifting load which has been a practice in France for 40 years. Basic idea here is you use excess nuclear electricity to heat up water. In particular during the middle of the night when there are low load conditions. EVs represent a sort of magic bullet type load because you can use this load to follow solar/wind and eliminate most of the ramps on your graph. There was no dispatchable atom power available, all peak power demand from early morning to late night was met by hydro power, solar power and power imports. Atom and coal and gas roaring away full power …….. well, 23 atom reactors weren’t available. Most oil and coal power plants available during the last record at 58 GW a few years ago are demolished or are in the process of. On Saturday, 1st of July there are 30 reactors down in France …. dispatched.